Each year, more deaths occur due to flooding than any other thunderstorm related hazard (lightning or tornadoes). In fact, floods are the #1 cause of weather-related deaths in the U.S. on average from 1994-2013. Don't understand how water can be so deadly? You're not alone, since most people, unfortunately, underestimate the force and power of water. But by the end of this slideshow, these 10 flood facts will have you convinced. According to the National Oceanic and Atmospheric Administration (NOAA), the 30-year (1994-2013) national average of flood fatalities is 85. In comparison, 75 people on average lost their lives to tornadoes, 51 to lightning, and 47 to hurricanes for the same time period. For 2014, flooding is the 4th leading cause of weather-related deaths. Source: NOAA NWS Office of Climate, Water, & Weather Resources. Natural Hazard Statistics. Accessed 17 June, 2015. Flash floods are so-called because they develop within minutes to hours (typically, under 6 hours) of a trigger event, such as a torrential downpour, a levee or dam failure, or the melting of snow pack. Flooding is caused by too much rain in too little time. But exactly how much is considered too much? In general, if your area is forecast to see an inch (or more) of rain per hour, or more than several inches total within a back-to-back three-day period or longer, you should expect flood watches and warnings to be raised. There's Such a Thing as "Flood Waves"
Flash floods can trigger a wall of water (a sudden swell within a stream, creek or river bed that moves rapidly downstream) of up to 10 to 20 feet high! You're 5 to 6 feet tall, so a few inches of flood water are no match for you, right? Wrong! It only takes a mere 6 inches of fast-moving flood water to knock an adult off of his or her feet. That's less than knee-deep! Regardless of how deep floodwaters are, it's NEVER wise to walk into or near flood waters, let alone trying to cross a flooded area on foot. Not only is it NEVER safe to walk through flooded areas, it's NEVER safe to drive through them either. It takes only 12 inches of rushing water to carry away a small car, and only 2 feet to carry away most other vehicles (including SUVs and pickups). According to the Centers for Disease Control and Prevention (CDC), more than half of all flood-related drownings occur when a vehicle is driven into flood waters. Storm surge, which is a type of flooding linked to tropical cyclones, is the leading cause of hurricane-related deaths. Flooding is a Coast to Coast Threat in the U.S.
Floods and flash floods occur in all 50 states and can happen anytime of the year -- even during winter (ice jams). By this respect, we all live in a flood zone (although not all of us are in a high-risk flood zone). While the Eastern U.S. has hurricanes and severe thunderstorms to blame for the majority of its flooding, snowmelt and rainstorms are the leading cause of flooding in the West. 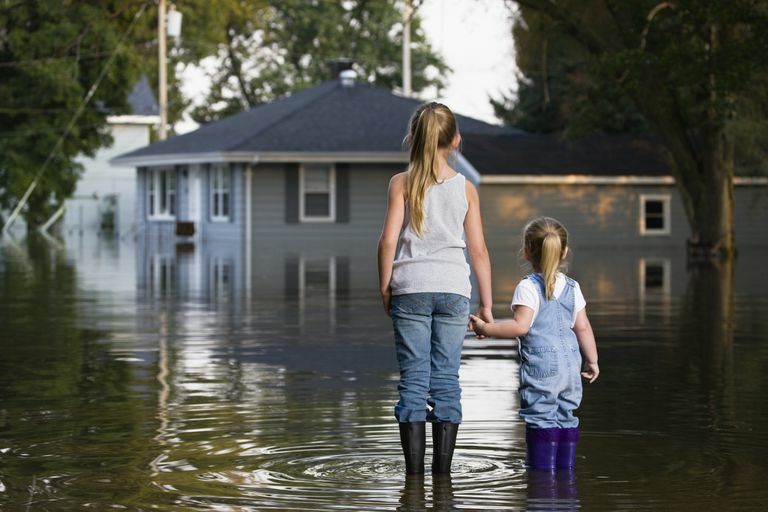 Flooding is the only natural hazard for which the federal government provides insurance -- the National Flood Insurance Program sponsored by the Federal Emergency Management Agency (FEMA). And it's no wonder why. A reported 90% of all U.S. natural disasters declared by the President involve some sort of flooding. Which Is More Dangerous -- Flooding or Flash Flooding?